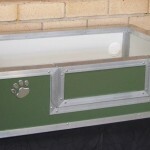 Whelping boxes are required for the safe birthing and raising of pups. Regardless of the breed, you will want a strong, sturdy, clean and draft-free box. 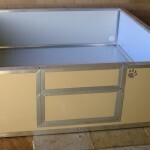 Kumfi Kennels’ whelping boxes are constructed out of Insulated Panels that have an anti-bacterial coating. Bacteria will not multiply on the surface of the whelping boxes. 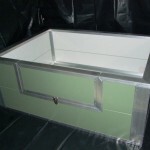 Our insulated panels will not absorb liquid or get mushy like other melamine whelping boxes which can only be wiped with a damp cloth. Some puppies may stay in the whelping box for anywhere up to five weeks after birth. When choosing a whelping box, it is important to make sure you provide a place big enough to contain the puppies, yet comfortable enough to eat, play and sleep in. Whelping boxes are designed to ensure the new mother can enter and exit of her own accord whilst containing the puppies within. At the entrance the front wall is trimmed down so mum can leave comfortably whilst still high enough to keep the pups inside. As the pups get older there is a secondary door insert, when installed it creates a level box (all four sides even in height). When selecting a suitable size for your whelping box you will need to allow enough room for the mother to lay down on her side and stretch out comfortably to nurse. If the box is too large, the pups may separate and crawl away from the group and get cold. If the box is too small, there will not be enough room for the mother and she may step or lay on the pups. Your whelping box will be delivered flat packed with assembly instructions. We do offer to build it for you at an additional charge. It is important to use a variable temperature controlled heating pad which is set to low and kept under blankets.